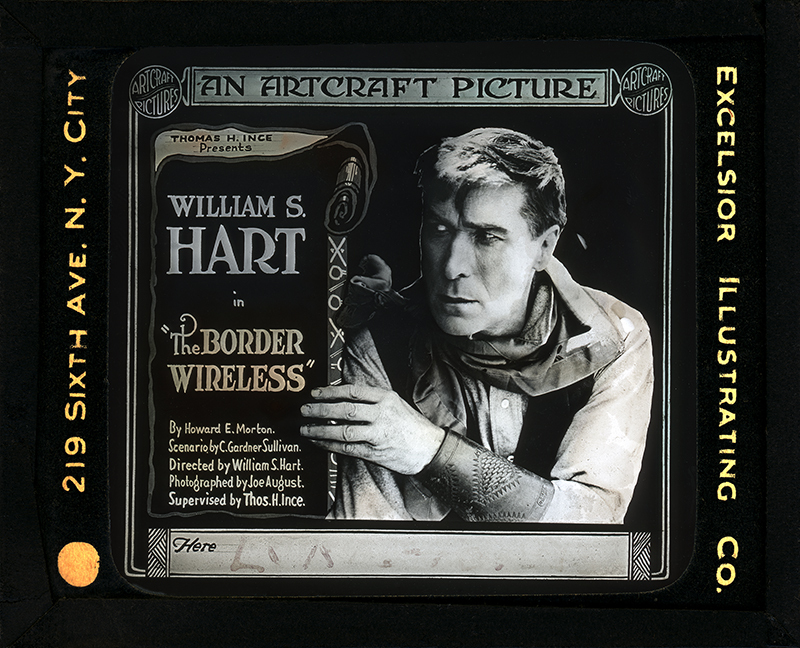 SCVHistory.com LW3488 | William S. Hart Stars in ''The Border Wireless'' (1918): Magic Lantern Slide. 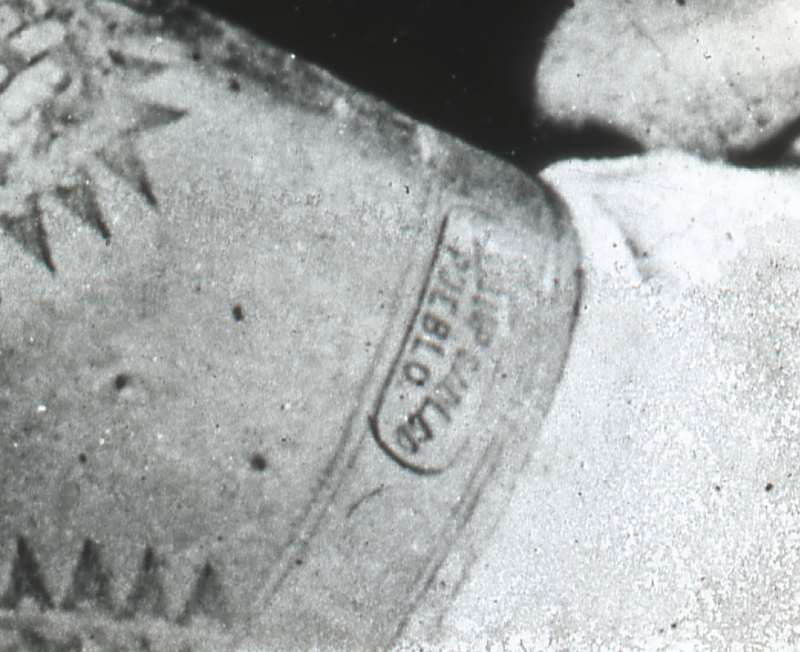 ABOVE: Closeup of Hart's leather arm guard. Click to enlarge. 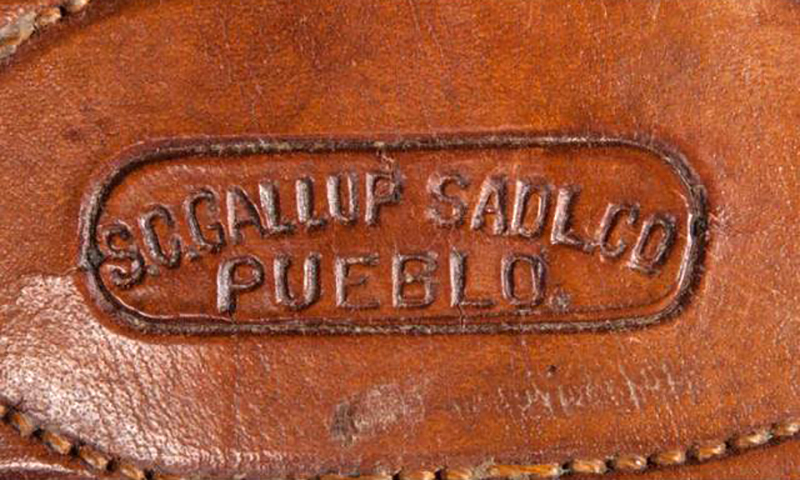 BELOW: Readers George Goodchild and Tamara Kroencke determined that it was made by the S.C. (for Samuel Caldwell) Gallup Saddle Co. of Pueblo, Colorado. S.C. Gallup used this mark in the early 1900s. Magic lantern slide advertising the 1918 William S. Hart vehicle, "The Border Wireless," from Artcraft Pictures, a Famous Players-Lasky company. Glass, paper, and tape, 3¼x4 inches (standard size), by the Excelsior Illustrating Company of New York City. Lantern slides were the movie trailers of their day. In keeping with Hart's typical bad man-turns-good trope, writer C. Gardner Sullivan has created a protagonist who is on the run from the law when he discovers that he has run right into a nest of German spies at the U.S.-Mexico border. The spies are sending wireless (radio) messages to Berlin. Hart's character holds the spies at bay until the Army arrives, and he even gets the girl in the end. "The Border Wireless" premiered on Broadway September 29, 1918, about six weeks shy of the end of real-life World War I. It was released for general distribution about a week after the premiere. Apparently the film no longer exists. Produced by William S. Hart Productions; advertised as "supervised by Thomas H. Ince;" distributed by Paramount-Artcraft; released October 8, 1918; © September 10, 1918; five reels (4353 feet). Directed by William S. Hart; screenplay by C. Gardner Sullivan from a story by Howard E. Morton; photographed by Joe August; art director, Thomas A. Brierley; art titles by Irwin J. Martin. CAST: William S. Hart (Steve Ransom); Wanda Hawley (Elsa Miller); Charles Arling (Herman Brandt); James Mason (Carl Miller); E. von Ritzen (Frederick Schloss); Bertholde Sprotte (Von Helm); Marcia Manon (Esther Meier). LW3488: 9600 dpi jpeg from magic lantern slide purchased 2019 by Leon Worden.